Also known as Carrigphierish, Ir. Carraig Phiarais, 'Pierce's rock'. Note that this peak is actually unnamed on the Discovery map, while both Carrigphierish and Sturrakeen are marked a little to the NW of this peak. Sturrakeen is the 439th highest place in Ireland. Sturrakeen's summit looks and feels a bit like an abandoned French Foreign Legion outpost. The desert surrounding it is more brown than white but there's a quirky sense that you've reached a defensive oasis, and that you could hole up and survive for a few days if you had to. I was there in December sunshine but the wind was howling and raging and after a near five mile trek from the Waterworks above Rossadrehid, I needed a respite. It was good to get into the lee of one of the layered conglomerates, looking for all the world like an old concrete shed, when suddenly there was silence and a brief moment of peace. To the best of my knowledge, there is no short run up to humble Sturrakeen. From the south you might consider Wicklore's route up from Cloheenafishoge, forest park entrance at R97390 20926 J, via Laghtshanaquilla, or perhaps a variation along the edge of the forest leading directly to your destination. From the east you start at S03827 26079 K which is the Mountain Road just west of Cahir. 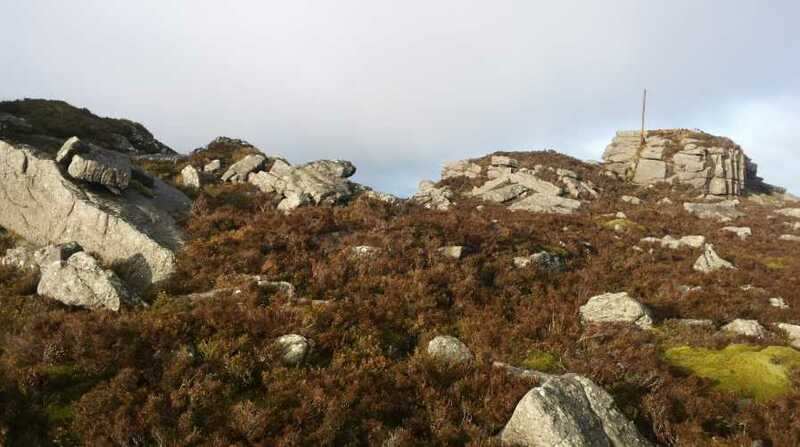 That's a popular start for the mighty Galty Traverse, and it will involve traversing the Slieveards. From the West you'll be coming from Galtymore and the Greenanes so you'll need to figure out how to get up to them first and then cross along the ridge. The shortest route from the north has to be from Clohernagh: there's a track the whole way to the Sturrakeen but I cannot say if there's parking at the start. Lastly, should you wish to inflict torture on yourself, you may wish to do as I did. Park at the Waterworks near Rossadrehid and walk the five miles to Sturrakeen.